Creams are made up of fat and water. They require emulsifiers for binding and use preservatives to prevent the formation of bacteria and germs. These substances cause an imbalance in the natural skin flora which may damage it. Mineral oils and animal fat are often included in the formulations, which clog the pores. These are the triggers for the most common skin problems and may even cause allergies. We made it our mission to discover all the wonderfully rich plant oils and essences that supply the skin with nutrients and active ingredients for a radiant complexion. What's more: the skin's natural balance is restored. The PURE SKIN FOOD Layering System was developed using the highest standards with the help of natural cosmetic experts. We would not settle for less than the best, and neither should you! We know that not all this organic is in fact organic, and we wanted to include only the best, high-quality organic raw materials in our range of products. The good news is: we have found it: our organic skin superfoods! Our Toning Moisturisers, a product that supplies the skin with the perfect amount of moisture if ever there was one. Selected, cold-pressed organic plant oils guarantee the highest natural active ingredient content, that deeply nourish the skin and seals in moisture. The fusion of our Toning Moisturiser and Beauty Oil reinforce the lipid layer to act against everyday influences, and together yield true fresh cosmetics composed of the ingredient wonders of nature. Discover the versatility of our Toning Moisturiser and Beauty Oil by clicking here. These 10 advantages of Beauty Oils alongside our organic Layering System will definitely impress you! Oil on your face? Oh, yes! Leave the creams behind, your skin will thank you for it and will not crave it at all! 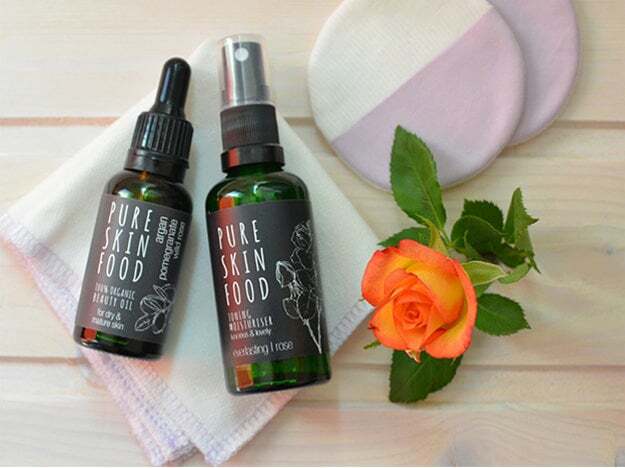 Unlike creams, PURE SKIN FOOD Beauty Oils do not require the addition of emulsifiers or chemical preservatives to supply your skin with concentrated and effective care. A small amount goes a long way thus, our Beauty Oils are very rich. While cheap creams are pumped full of fillers, we use precious cold-pressed premium oils of organic quality, that supply your skin with the maximum in nutrients and active ingredients. Plant-based face oils penetrate the skin more effectively than creams, thus transporting the active ingredients to the layers of the skin where they are best absorbed. The oil-cleansing method is effective for use by all skin types (yes, including oily skin!!!) as recommended by cosmetic experts. Oil ultimately cleanses and frees the pores from any dirt and bacteria, regulates fat and sebum transport and promotes healing. The natural balance of the skin is therefore restored. Essential fatty acids are of utmost importance when it comes to face care because they ensure the health of the cell membranes and the moisture supply in all skin layers. They are referred to as being "essential" because our body cannot produce them by itself, and our body requires them in order to function. Oils rich in essential fatty acids protect our skin from disturbances, for increases softness and suppleness. Inflammation is our skin's worst enemy and the cause of aging. Plant oils obtained from seeds have effective anti-inflammatory effects and form air-permeable lipid protection against external influences. Furthermore, they accelerate the regeneration process. When we age our skin loses its natural moisture barrier. Dehydrated skin makes fine lines appear more extreme. Face oils help to safeguard the moisture supply and oils obtained from argan, wild rose or pomegranate kernels have an effective anti-aging effect. Using face oils to neutralize oiliness in the skin seems a tad counterproductive - but this is not the case since oil binds with oil and helps to regulate the production of sebum and fat in order to restore the skin's natural balance. It is essential to supply the skin with the right kind of oils and fatty acids to prevent it from overproducing sebum. The right kind of face oils regulate the skin's own oil production, keeps the pores clean and fight bacteria and inflammation. The most effective oils for this purpose is contained in our Beauty Oil for Young & Combination Skin. Put an end to the creased make-up look that often arises during the course of the day by apply a face oil as a base for your make-up. The oil penetrates the skin and safeguards the moisture supply, thus you are able to maintain a fresh and flawless make-up look for longer. Numerous plant oils possess antioxidant superpowers. Plants produce their own antioxidants to protect themselves against environmental influences, and have a positive effect much like free radical scavengers. Let's take advantage of that!